inkingpink: A trendy tree in my urban garden! This is the sketch today at SCS, its very "user friendly". 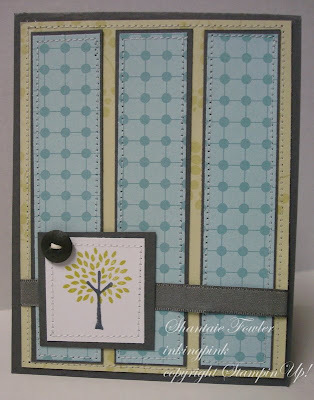 I started with a basic gray card, and layered urban garden DSP from Stampin' Up! I stitched around all the edges, and taped down a strip of taffeta ribbon in basic gray, the stamp is from trendy trees and the button was in my box of many buttons. This will be one of the Fathers day cards I send out...hmm I wonder who I will give it to?? Thanks for your sweet comment. I love your cards, especially the first one. It doesn't look quick...just beautiful! A wonderful card to make for all my fabulous gardener friends. 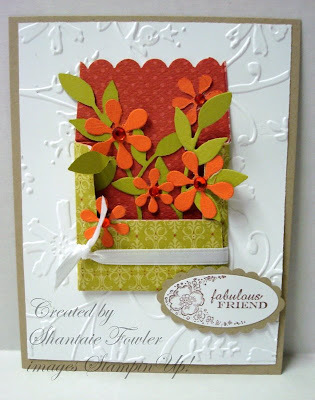 I think the sissix envelope gives the appearance of a colorful window box!